The trial of former SS officer Oskar Gröning has begun in a charged atmosphere of historical debate and Holocaust-denial. Ben Knight witnessed the protests outside the courthouse in Lüneburg. 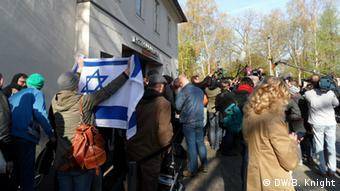 There was trouble in the long line outside the far-too-small court building in Lüneburg where what could be the last ever Holocaust trial began on Tuesday. With only room for 60 spectators in the hall of the “Ritterakademie” building, around 40 people from a local anti-fascist group had arrived at six in the morning as part of a “place-holder” operation to ensure that relatives of the co-plaintiffs – some 65 Auschwitz survivors – would find space in the court. The neo-Nazis’ informal leader, Thomas Wulff, who said he belonged to a “nationalist movement,” began a series of angry debates with the gathered press pack and others in the line about German history and the Holocaust. Many German people had also come to show their support for the Holocaust victims. “It’s very important that this trial is taking place now,” said Meline Dumrese, who was one of the founding members of the organization that campaigned for the creation of the Holocaust memorial in central Berlin in 2005. The neo-Nazis were accompanied by 87-year-old Ursula Haverbeck, who has received several fines in the past for questioning the Holocaust. She had appeared on a Youtube video posted on Monday condemning the trial and calling on protesters to attend. She also handed out a pamphlet entitled “Mass-murder in the concentration camp Auschwitz?” which questioned the historical evidence for the Holocaust and offered lower estimates for the number of murdered Jews. This is illegal in Germany. Eventually the Holocaust-deniers were ordered to leave by police. A police spokesman, who was on the scene, said an investigation had been started into two people on charges of incitement to racial hatred, and a number of flyers had been confiscated that were suspected of spreading Holocaust-denial. The incident was ironic because one reason why Gröning’s case has come to trial is because he originally went public in the 1980s to counter Holocaust-deniers, one of the few former SS officers to do so. His testimony about his own actions, both to prosecutors and via extensive interviews to Der Spiegel and other media in 2005, provided vital evidence against other officers, but is now to be used as evidence in the case against him. For attorneys like Thomas Walther, who is representing over 40 Auschwitz survivors and spent years trying to bring cases like Gröning’s to court, the trial represents a crucial turning point in the history of the German judiciary. If Gröning is acquitted or the case dropped, it would mean a return to what many feel is decades of judicial quiescence over the Holocaust. One historian has calculated that around 6,500 SS officers served at Auschwitz alone and survived the Second World War. Only around 50 were ever convicted in Germany. From the foundation of the new Germany in 1949 to 2011, hundreds of thousands of charges of murder and accessory to murder were dropped – because no proof of specific murders could be found, or no proof that specific actions “caused” the deaths of millions of people. The old judicial inaction was partly down to the political climate in post-war Germany. Chancellor Konrad Adenauer, in his determination to start Germany anew from a so-called Stunde Null (“zero hour”), discouraged the prosecution of Holocaust perpetrators and allowed Nazi-era judges and other state officials to continue in their posts. On top of this, the German criminal code was simply not equipped to punish the unique nature of the evil of the Nazi Holocaust. Although a law against genocide was introduced in the 1950s, it could not be used retroactively, meaning that the only charges against Nazi criminals could be murder or accessory to murder. Since the whole system of the Final Solution was based on de-personalizing the act of murder, in practice that meant very few individuals could be convicted. Yet for many attorneys like Walther, even these caveats do not totally excuse the inaction of the German judiciary over the Holocaust. It was, after all, possible to convict the Hamburg-based student Mounir al-Motassadeq for accessory to murder for transferring money to the perpetrators of 9/11, yet Gröning’s actions – transferring money to the SS – was not considered a crime when Frankfurt state prosecutors looked into his case in 1985. “The causality of his action” was not necessary “for the success of the extermination operation,” they concluded. It was only in 2014 that Hanover state prosecutors disagreed and the case was re-opened. The neo-Nazis have been banned from coming to the courthouse for the day, but they are expected to show up again tomorrow. “But we will be there too,” said Kuzbik. “We’re going to be there every day of the trial.” Some 27 court days have been planned for the trial until the end of July.